The toppling of a regime, whether by civil insurrection or military coup, invariably gives rise to a fierce struggle over the lineaments of the new order. This transition phase is the moment of truth in every revolution. It is informed by a collapse of the justice system, a deep sense of uncertainty, and a resort to exceptional means on the part of those steering the helm. Among the more pronounced governing measures that tend to be implemented during this juncture is the prosecution of the new regime’s opponents in special courts. 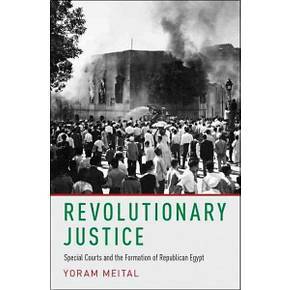 In light of the above, Revolutionary Justice focuses on the unique and decisive role of two such tribunals that were set up in Egypt following the military coup on July 23, 1952. While “show trials” against political dissidents are generally considered of little historical value, Revolutionary Justice argues that the rhetoric generated by the special courts under review played a crucial role in the denouement of political struggles, the creation of new historical narratives, and the shaping of both the regime and opposition’s public image. The deliberations at these tribunals nourished the prevailing emergency atmosphere, which helped the Free Officers tighten their grip on the helm and advance their plans for a new dispensation in the face of strident resistance. On the other hand, the responses of defendants and witnesses to the questions thrust at them during the trial exposed weaknesses in the official hegemonic narrative. Paradoxical as it may seem, oppositional views that the regime tirelessly endeavored to silence and exclude from the public discourse were tolerated and recorded in the courtroom. Although the Egyptian legal system has merited considerable scholarly attention, there is a glaring shortage of in-depth analysis on its special courts. To date, references to these sort of tribunals center around their verdicts and sentences, and most of the information is gleaned from the era’s press reports. Conversely, Revolutionary Justice focuses on the goings on within and outside the courtroom by predicating itself on the original ten volumes (in Arabic) of the courts under review. The significance of this corpus stems from the fact that the court’s transcripts not only document positions, but they afford a rare glimpse at a direct and wide-ranging dialogical “exchange” between parties that held conflicting views. Put differently, these records have preserved voices and arguments of hegemonic speakers, namely judges and prosecutors, as well as those of the opposition – defendants and witnesses. In the process, they reveal the unbridgeable gaps between the official narrative and the counter narratives put forth by the regime’s critics. The focus of Revolutionary Justice is on a select number of trials that were held at the Revolution’s Court (Mahkamat al-Thawra) and the People’s Court (Mahkamat al-Sh‛ab). Over a thousand of the new regime’s adversaries—the majority of whom were members of the Muslim Brothers, but also senior officials in the previous government—were prosecuted within the framework of these special tribunals. By dint of the swift convictions and severe punishments handed down by these courts, the opposition was kept out of the public sphere for the better part of two decades. What is more, the People’s Court decided the outcome of the epic power struggle within the upper echelons of the military government pitting Prime Minister Gamal ‘Abd al-Nasser against President Muhammad Naguib, as the judges and prosecutors left no stone unturned in their effort to demonstrate the existence of a conspiracy between Naguib and the heads of the popular Islamic movement to seize power. At the conclusion of the trials against the movement’s top brass, the president was stripped of his authority and placed under house arrest, where he would remain until his passing some thirty years later. Naguib’s powers were transferred to the Nasser camp whose members thus became the undisputed masters of the Nile Valley. At the outset of the July Revolution, the Free Officers strove to replace the monarchy with a democratic system of government that raised the banner of equality and justice. Their social and political achievements notwithstanding, Nasser and his confederates laid the foundations for an authoritarian government that would reign well into the next century. The tribunals under review were dissolved at the end of the July Revolution’s transitional period. However, the long-standing Egyptian practice of adjudicating citizens before special courts would reach new heights in the decades to come. Although the names given to these institutions changed over the years, they were all conferred with exceptional powers. The widespread use of these tribunals, including the military variety, turned this exception into the rule. As the more recent popular uprising against Hosni Mubarak gained momentum, a riveting public discourse took shape in Egypt that compared the revolution of July 1952 to that of January 2011. In both cases, a strongman’s ouster raised hopes among many Egyptians that a “new beginning” was just around the corner. Additionally, each of the attendant transition phases were undergirded by the following developments: a military council assumed control over the daily running of the state; the powers that be declared a national state of emergency; and a fierce political struggle erupted over the contours of the new dispensation. What is more, the acting governments took extraordinary measures, foremost among suspending the constitution, disbanding parliament, and summarily arresting thousands of people. Many of the detainees were ultimately prosecuted by military and special courts. President Mubarak, members of his family, and senior government officials were brought to justice in what Egyptians have dubbed “the trial of the century.” Perhaps the most dramatic occurrence of the Egyptian 2011 revolution was the Muslim Brotherhood’s rise to power. However, the movement quickly discovered that assuming the throne is far easier than calling the shots. Exactly one year after being sworn in as the sixth president of the republic, Mohamed Morsi was ousted from his post (July 2013) and is currently on trial for a long row of serious crimes. Drawing on insights gleaned from the July Revolution, the book’s concluding chapter compares the transition phase now underway to the events of 1952. A comprehensive study on the role of special tribunals and the justice system at large in the making of republican Egypt is bound to attract researchers and students from various disciplines who are interested in why the surfeit of revolutions in the Global South has mostly spawned authoritarian regimes. Unlike the over-generalizing orientalist and essentialist theories according to which the southern hemisphere is inherently undemocratic and its religions and cultures inimical to liberal values, Revolutionary Justice point of departure is that the particular justice system in each country has loomed large in the final outcome of these successions. Given the universal engrossment with the Arab Spring and the trials against the region’s ousted strongmen, this study is also likely to merit an extensive readership beyond the halls of the academe. Yoram Meital is Professor in the Department of Middle East Studies and Chairperson of the Chaim Herzog Center for Middle East Studies and Diplomacy at Ben-Gurion University.